Confession: The subject of this latest Kulinarya challenge is completely new to me! 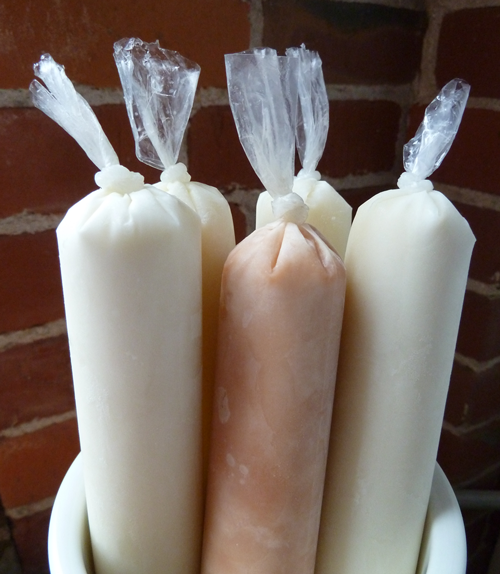 Ice candy is typically made using long plastic bags that are tied at the top. These bags are usually 1½x10 inches and from what I hear, can be found in the US in Filipino markets. I didn’t have a chance to get to my usual spots, but I found 2×10 inch bags on eBay, which produce a thicker ice candy, which was just fine with me. Use your favorite popsicle mold if you can’t find the bags. While doing research for this challenge, I loved seeing all the different ways ice candy is served in the Philippines; the use of fresh fruits is pretty mind-boggling. But if I was going to do this challenge any justice, I’d have to draw from the memories of my own American childhood. Fruity Pebbles Ice Candy (center) guarded by Froot Loops Ice Candy. Cereal milk has always been an indulgence, especially when artificially flavored fruity or chocolately cereals are involved. It’s analogous to the icing on the cake; an extra reward after finishing off something delectable and sweet. Over the past few years, cereal milk’s popularity grew when it became a drink and a featured ingredient at David Chang’s Momofuku Milk Bar. Bottles of cereal milk, cereal milk soft serve ice cream, and cereal milk panna cotta — along with Milk Bar’s compost cookie — made Momofuku pastry chef Christina Tosi famous, and the official Momofuku Milk Bar cookbook was released in October 2011. You don’t really need to follow the recipe in the book…cereal milk is made by simply steeping cereal in milk and then straining it. Tosi adds a little brown sugar and salt after steeping to balance flavors, but your own taste buds will let you know if you’re satisfied with the flavor after steeping. Tosi’s recipes use toasted Corn Flakes, Fruity Pebbles, and Cap’n Crunch, but you can use whatever cereal you want. Serious Eats has a fantastic post about the best chocolate cereal to make chocolate cereal milk (they preferred Cocoa Puffs and I concur with them that Cocoa Pebbles are generally awful. 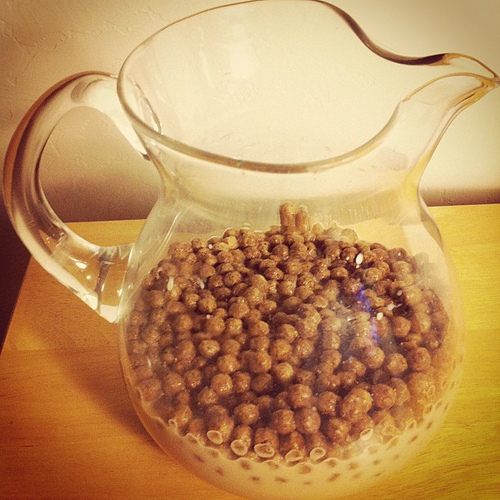 Making a batch of Cocoa Puffs cereal milk. Crush the Fruity Pebbles with your hands until it’s the texture of coarse sand. Place all the ingredients in a bowl or blender and stir to combine. Use a funnel to fill the bags leaving enough room so you can tie them off at the top. Tina at Pinay in Texas has some really good instructions on how to do this. Place ice candy on flat on a tray or plate and put them in the freezer for at least 8 hours. When they’re ready, the ice candy will be firm but not rock hard. 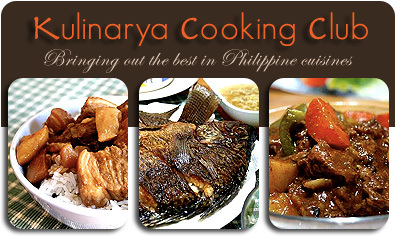 You can join the Kulinarya Cooking Club too! Oh yum, I love Froot Loops too. As soon as I get freezer space I’m making some! Wow, I like your take on ice candy challenge – it is unique! Oh yeah, the good old triple 15 cents a scoop ice cream. That was always a treat for me and my sisters during our laundry mat summer days next to the Thrifty Drug Store here in LA. Thank you for sharing this ice candy and the memories. Thanks, Ray. I grew up in SoCal and walked to Thrifty almost every other day when I was a kid. I miss those cylindrical scoops! Those are nice memories and I love your take on this ice candy challenge! Thanks, peachkins! I felt so un-Pinoy because I only just now heard of ice candy, but it was fun researching and making these! I’ll definitely be making more from now on! Awesome– I was thinking of making cereal milk ice candy too! Didn’t bust out my Momofuku cookbook in time! Thanks! Once the idea popped into my head, I had to run with it. It’s funny how simple making these really is. I just ate but now I’m hungry again after reading this delish post & seeing those great Iced Candy photos. Thanks for the recipe, Arnold & for hosting this event together with @JunBelen! Glad to do this fun KCC March event with you! Oh yum! I like this! Something my boys would love. They are not into fruity ones, they love chocolates and milk and cereals. Thank you for the wonderful theme! Amazing choice of ice candy flavor! My daughters love fruity pebbles! I’ll be trying this the next time I make ice candies!